Kristina works on long-haul flights, and regularly visits Shanghai, her favourite destination. She believes that Shanghai embodies modern China – big, sparkling and fast-paced. Although she now knows the mega-city really well, because it is constantly growing there is always something new to see every time, and it's always worth a visit. 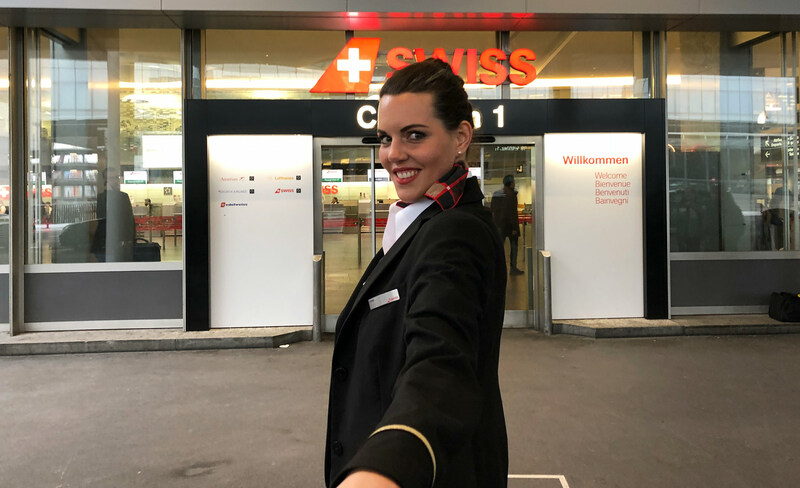 SWISS flies to Shanghai (PVG) daily from Zurich (ZRH). With a population of almost 25 million Shanghai is not only by far the biggest city in China, but it is also one of the ten biggest in the world. State-of-the-art architecture next to traditional buildings – the juxtaposition of these opposites is typical of China. These contrasts are tangible in Shanghai, and make this city on the East China Sea an attractive and unique travel destination. The climate is generally well-tolerated and subtropical, although the thermometer may rise to 40 degrees Celsius in summer. July and August also have the heaviest rainfall. It is therefore worth visiting Shanghai during the transition period, since the temperatures in spring and autumn fluctuate between 15 and 20 degrees Celsius. If you want to conquer Shanghai, you're going to need plenty of energy! And the extensive breakfast buffet at the Hyatt Regency is just the thing. "Enjoying these views with your morning coffee really sets you up for exploring the city!" says Kristina. After breakfast, Kristina is ready for a long walk beside the Huangpu River. On the promenade, you can almost watch the rapidly-growing city develop. And you can understand how flawlessly the futuristic buildings will blend with the modern cityscape when they are completed. This dynamic never fails to amaze Kristina. "I feel as if I had travelled to the future." The former French Concession, which was administrated by France in the late 19th century, is still called the French Concession today. Numerous buildings bear witness to this period. Today, though, the area is one of the trendiest and most popular parts of the city. There are numerous restaurants and cafés to explore. The quarter is also the perfect place for a bit of a breather away from the city bustle. "The atmosphere is really cosy and friendly – not really typical of the otherwise vibrant city of Shanghai." It's not far from here to Tian Zi Fang, a former industrial area with lots of empty factories and warehouses that now are home to little shops and cafés. Kristina loves visiting the tea shops. "They have wonderful ceramics and, of course, the best tea – perfect for taking home to my loved ones." No visit to Shanghai is complete without a stroll along the 2.6 km of The Bund, the famous promenade. It's full of tourists at the weekend, which is why Kristina advises "It's best to come during the week, or at least in the afternoon, when it's not so busy". The Bund Financial Center is the impressive end to the walk along The Bund. The exterior consists of bamboo-like colonnades that move in opposite direction. "It really does look as if the whole house were moving. I could watch it for hours!" If your preference is for relaxation in the countryside, then Kristina recommends Fuxing Park. This park used to be the biggest one in the city, and is perfect for relaxing – as well as allowing you to watch the locals playing, dancing or making music. Later in the afternoon, shortly before dusk, Kristina strolls around the streets of Fang Bang Middle Road in the old town. There are lights everywhere that show the typical Chinese architecture, playful and full of details, at its very best. Dogs, dragons and other mythical creatures adorn the traditional houses and temples in this district. "There is so much to see – and if you still need a few gifts, you're sure to find what you're looking for here." The sunset is best admired from far up. At the Flair Rooftop Bar of the Ritz Carlton, Kristina enjoys a drink as she admires the breathtaking views of the city and Pearl Tower, probably Shanghai's most famous landmark. "I've had the most expensive drink of my life here. But the views are priceless!" Typical Chinese cuisine is served at the Haidilao. An absolute highlight for Kristina: "I love hot pots! They're similar to fondue Chinoise, but have more ingredients – and are much, much better." If you can still stand, then end the day with another drink at the Vue Bar. "Enjoy it admiring the skyline – simply magical. I'll never get tired of it."